Hi, nice to meet you. Benefits of receiving a psychic reading: ? Answer questions about your future. ? Provide assistance in making decisions and problem solving. ? Explore the potential of present and future relationships. ? Help you to regain a sense of control in your life. ? Find out more about yourself and those around you. ? Find out what will happen if you stay on your present course I offer comfort and direction when life gets painful or confusing. Be it Love, Career, Finances or Relationships, I understand how everyday life can obscure your inner voice. 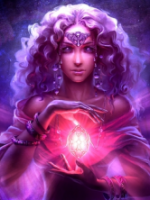 Expect to receive a reading that provides inspiration to empower oneself, meet life's challenges and uplift your world by offering clarity, wisdom, and insight. I am a heart-centered reader gifted in helping others to understand the energies that are currently manifesting and how to best deal with them in any area of your life using My gifts of empathy, clairsentience, and clairvoyance psychic abilities. Name some specific experiences where you've used your abilities.I have been working professionally as a psychic since many years. I have read for thousands of people online and face-to-face. I call myself a 'Love Expert' because it is what I have mainly focused on in my career.